My mother, Sharon, and I have spent the majority of last year convalescing my grandmother (Sharon’s mother), who was diagnosed with final stage heart failure. Her ill health was no secret. At 40 years old, my grandmother suffered her first heart attack. My mother was informed by the doctor that they would be attempting a then experimental angioplasty. Grandma made it out of the hospital but continued to smoke heavily, eat fatty foods and spend the majority of the day with her rump parked firmly on the couch, watching television westerns. She loved westerns. In her home, she’d turned the living room into an saloon, complete with carved wooden bar with stools. The shelves were lined with bottle upon bottle of exotic liquors and tinctures that when teased by the sun’s rays, transformed the room into a tippler’s cathedral. The crowning glory of this room however was the hand carved billiards table, adorned with emerald felt. For me, the scent of chalk dust, cigarette smoke and whisky are inextricably linked to Christmas, and the evenings that I spent shooting pool with my cousins. My grandma however, seldom rose from her chair. With a cigarette smoldering between two immaculately polished talons she’d greet every morning like a true cowpoke. Without fail, she’d belly up to the breakfast table with a plate of scrambled eggs marinated in butter, salt so thick on top they seemed to be carved from crystal. Then she’d add a side of bacon, sausage, two slices of toasted Wonder bread and a cup of coffee, black. Two heart attacks would follow. Of course we never were. I was Grandma’s primary visitor. So entwined were we that I’d even bring my friends over to her house, and we’d all sit there and smoking and laughing the night away. Until Grandma had her first stroke. You might presume that this would have served as a wake up call to her, but you’d be wrong. Instead, the family was shaken into action, doing their best to forcibly try and implement a more healthful regiment for Grandma. My mother removed every cigarette stashed in Grandma’s home, and my then boyfriend sold the trash bags full of indigent cartons off at the gas station where he worked. In my own private act of rebellion, I’d slip grandma one of my smokes from time to time, like a wise guy in a prison epic. My thoughts being that at her age, what did it matter? Let the old broad have her cigs! What can I say? I was young. 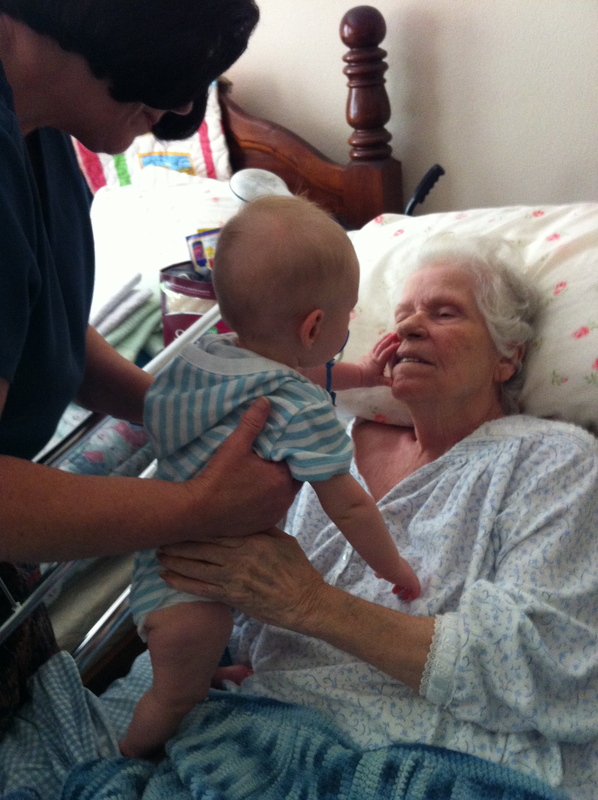 For a period of time, Grandma tolerated the physical therapist sent over by the hospital. That period of time didn’t stretch beyond more than a few weeks, and Grandma, in true cavalier style, threw a fit that sent her therapist running for the hills. One thing that could be said for my Grandmother is that she always had her way. She could tolerate the damage sustained to her body from the stroke, not being able to write, or draw her eyebrows on properly with her right hand, but there was no way in Hell she’d tolerate someone telling her to turn off the television and do her exercises. Grandma could still walk at this point, but beyond a trip to the kitchen to rifle through drawers in search of her pilfered smokes, she seldom did. She’d go grocery shopping with my mother and myself, enabled by her walker, but she was slow, awkward and all too aware of the pitying eyes upon her. Eventually, she stopped leaving the house even to do groceries, and would instead dictate a list. My mother took over the duty, making the weekly jaunt to the market for her. Plastic bags filled with a veritable menagerie of fatty delicacies were ushered in and tucked away in cupboards and crisper drawers all while my Grandma watched the Westrens. Looking back, this just enabled my Grandma to settle into her decline. It was impossible to ignore my Grandmother’s mental deterioration during this period of self-imposed hermitage. Her conversation became erratic, peppered with barrages of vehement anger which tapered into regret or nostalgia. She’d invent stories about family members and relay them to us with unshakable adamance. Grandma, having lived vicariously through television for some time at this point, was forgiven for her tenuous relationship with reality. She could be persuaded, with a heroic amount of effort to leave the house for doctor’s appointments, but beyond this she preferred the more familiar world of her beloved cowboys and indians. It became less funny when Grandma had to be taken to her doctor’s appointments in a wheelchair, unable to walk more than a few steps without exhaustion. Another stroke followed, a broken leg from falling out of bed on now brittle bones, and eventually a bleeding ulcer landed her in the hospital. Things weren’t remotely funny anymore, in reality, they hadn’t been for some time, but Grandma had great skill in making the abhorrent seem blasé. During her stay, she was diagnosed with dementia and final stage heart failure. I still feel a strange pang of guilt over these diagnoses. While doing my undergraduate work in psychology I read more than one article which suggested that nicotine, which she had been getting a hearty does of daily until my family’s interference, might be beneficial in delaying dementia caused by Alzheimer’s. Had we brought on her mental enfeeblement? Conversely, the cigarettes she was smoking likely aided in compromising the cardiovascular and pulmonary health, bringing on the stroke, perhaps we should have stepped in sooner. This, when compounded by the spoonfuls of transfats we’d enabled her to shovel into her mouth had essentially caused her body to crumble into decrepitude. I decided to surrender my Camels once and for all and make a concerted effort to curb my cravings for take out. Ironically, she was the most active she’d been in years while in that hospital bed. She bit one nurse and punched another, successfully terrifying the hospital staff. She even hatched an ill fated escape plan, tearing off the tangle wires and tubes that ensnared her and throwing herself out of bed, catheter still inserted, demanding she be set free. Eventually she got her wish and was sent home from the hospital with the conditions that she regularly meet with a cardiologist, under go physical therapy and never be left unattended. My mother and I moved in with her shortly there after. She would watch over my Grandmother during the days from 10am to 10pm, and I took the night shift, 10pm to 10am. Grandma didn’t make it easy. Her bed now took the place of her easy chair, and she’d lay there, watching her cowboys. They were the same tired old epics she’d watched time and time again. Episodes of Lawman played back to back from 11am to noon, when an episode of Wagon Train broke the monotony, followed by and hour and a half of Gunsmoke, a smattering of Bonanza, and then three gunslinging movies which would be repeated after their first complete cycle. We’d bring her meals, trying at first to keep with a more heart healthy menu. Grandma responded with a hunger-strike. It soon became obvious that she would not be compelled into doing her physical therapy. She’d kick her legs for a few minutes and insist it was enough, then launch into hysterics. The bed soon became her permanent domain, leaving it only to use the toilet, a chore which required more assistance than is dignified to divulge. She didn’t leave that bed until Hospice became involved, and she was moved to a hospital style lounger set up in her own room. She was delighted when the hospice nurse told her that she was allowed to eat whatever she liked, failing to understand the reasons behind this. She was dying. Her treks to the bathroom became too exhausting, and she required oxygen just to move the few feet required. Soon she had so little mobility that she had to be changed in her bed on a regular basis, all to the tune of strumming guitars and stampeding hooves. Though it was a labour of love, the care my Grandma required became too all encompassing for my mother and me to handle as a tag team. This became especially pertinent with the birth of my nephew and niece. Both my mother and I wanted desperately to be involved in these lives, which were just newly blossoming. At the same time, we couldn’t deprive my Grandma of the dignity and love that a person in their dwindling days deserves. With much debate, we finally arrived at the solution of bringing in a paid caregiver on the weekends. Though it was a big expense, it enabled us to maintain more order over our own personal relationships, finances and all the obligations which we had been forced to set on the back burner. Unfortunately, it wasn’t that simple. My grandmother did not die an easy death. She suffered excruciating pain in her legs from peripheral artery disease. She battled her body for each and every breath. Only morphine softened her agony. 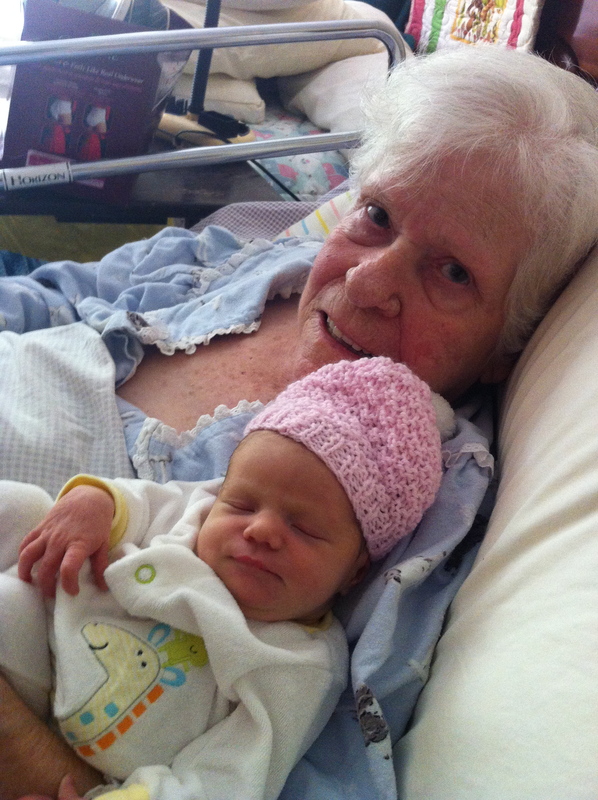 My grandmother passed away at the age of 81 on November 30th, 2012 at 4:57pm. She was the youngest of her siblings, survived by two sisters in their 90′s. As I write these words I question what more we could have done. We brought her to all her medical appointments, but did we fail her in that we didn’t push harder for her to take care of herself. We could have refused to do her shopping for her and demanded she come along, if only for the exercise. We might have only brought in the groceries we deemed healthy enough for her consumption. Maybe I should have unplugged the television, or smashed it and demanded she get up and do something. I beat myself up, questioning whether one of the cigarettes I snuck her all those years ago was the one that brought on the stroke. Intellectually I realize that just one wouldn’t have been the culprit, but rather a life lead without concern for her own well-being. The truth is she was an adult woman, capable of making those choices for herself. You might argue that she was ignorant of the harm her behavior brought on, that people of her generation didn’t receive the same education we do now on such things. However, after numerous doctor’s visits she was well warned of the perils that lay down the path she’d chosen. In the end, it all comes down to choice. 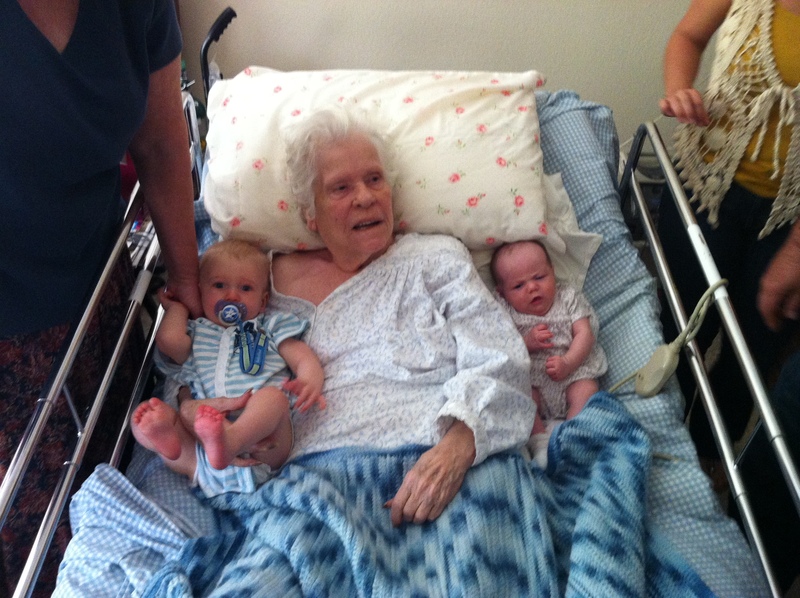 Grandma got a chance to meet her great-grand children before she passed away. Exercise and eating well are things that have to become habit for us, not something we pick up now and again when we want to drop a few pounds or fit into a dress. Your body has to be your first priority, not for reasons of vanity, but because it is the vehicle with which you move through your life. Healthy doesn’t have a finite weight, it isn’t something necessarily defined by a scale, it’s a way of living each and every day that enables you to make the most of the flesh you were given. We live in a society that believes health is immediately visible, and that’s a dangerous fallacy. Not everyone who works out regularly or eats healthfully winds up looking like the spandex-clad gym bunny we are taught to associate with fitness. There are too many variables in each person’s unique make-up to guarantee one body type will be attainable. Likewise, not everyone who is thin is some masochistic anorexic who lives an impossible lifestyle. Anorexia is a pattern of behaviors that no medical professional would ever diagnose by weight alone. Make no mistake, there are absolutely fat anorexics out there, not all of whom will survive to become slim. Somehow we’ve been taught you are either fit or fat. Fitness is seen as a beauty enhancement, and marketing targets the young, active and hip. The truth is that no matter what your age, weight, mobility level or perceived hipness quotient you need to care for your body. This blog is back on track, its a new year and we are newly committed to seeking out alternative exercise plans for the mobility challenged, physical fitness programs that don’t require special equipment or a gym membership, and healthful recipes that don’t require a private chef to pull off. I don’t wish to imply that the last year was joylessly spent watching my grandmother’s decline, there were some very positive developments as well. My sister, Jessica, became a doctor of kinesiology, and we fully intend to exploit her expertise for this blog. I became engaged, and will be writing about my struggles with dress fittings, menu planing and my pre-wedding fitness regime. We’ve grown a lot in our time away from the blogosphere, (and no, not meaning our waistlines.) We’re looking forward to telling you all about it! Expect a new article posted every Wednesday!